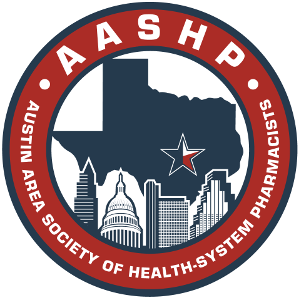 ​To join AASHP, please join the Texas Society of Health-System Pharmacists by following the link below. Select the Austin Area Society of Health-System Pharmacists as your local organization. R&E Foundation - scholarships, poster competition, research grants and more! Please note: Members of the East Texas local chapter that wish to only join the local society and not the state (TSHP) society, should contact the local chapter directly. Individuals who are licensed or eligible for a license as a pharmacist by any state, district, or territory of the United States. Pharmacist members may vote and hold office within TSHP. Non-pharmacists who support the objectives of TSHP shall be Associate Members. Associate members may attend meetings, and may be granted the privilege of the floor, but shall not be entitled to vote or hold an elected office (except as otherwise provided in the TSHP Bylaws). Individuals who are/were licensed or eligible for a license as a pharmacist by any state, district, or territory of the United States and are fully Retired from pharmacist work. Retired Pharmacist members may vote and hold office within TSHP. A New Practitioner is an individual who is within 5 years of graduation from a School or College of Pharmacy and is licensed or eligible for a license as a pharmacist by any state, district, or territory of the United States. New Practitioner members may vote and hold office within TSHP. Individuals who are registered with a state board of pharmacy as a technician, certified as a pharmacy technician or employed as pharmacy technician or technician in training in any health care setting, work under the supervision of a licensed pharmacist, and assist in preparing, distributing or administering medication shall be eligible for Technician Membership upon payment of the appropriate dues. Technician members may attend meetings, and may be granted the privilege of the floor, but shall not be entitled to vote or hold an elected office (except as otherwise provided in the TSHP Bylaws). Individuals enrolled full time in a pharmacy degree program (graduate or undergraduate) in an accredited college or school of pharmacy or a pre-pharmacy program leading to enrollment in a college or school of pharmacy are eligible for pharmacy student membership upon payment of the appropriate dues. Student members may attend meetings, and may be granted the privilege of the floor, but shall not be entitled to vote or hold an elected office (except as otherwise provided in the TSHP Bylaws). ASHP Membership for a student currently enrolled in a School or College of Pharmacy. **Please NOTE: ASHP student membership is NOT an automatic function but may be added to your membership (additional $50 membership fee). When paid through TSHP, ASHP membership typically takes 2-3 weeks to process, however it may take up to 4-6 weeks to activate during peak times. Please consider this time when attempting to register for ASHP events.